You look incredible good Andrea! And the dress is made for you, very very nice! Such a happy dress. Looking great! I saw this on some link ups and had to pop over to tell you how darling it is. And I love the photo of you and your lil guy toasting OJ’s! I spotted this dress and was very tempted by it too. Anthro right? It looks wonderful on you! 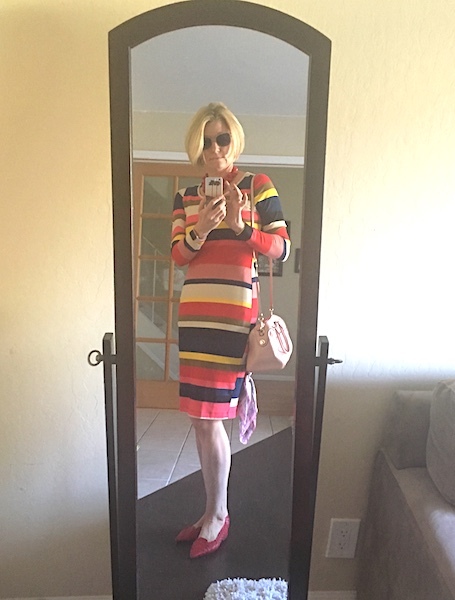 You look phenomenal in that multi-colored striped dress Andrea. Fits you like a glove. Just reminded me that I own a similar dress I must wear soon. Wow, you look hot in that dress, Andrea! Thanks so much for linking up with Fun Fashion Friday and have a fab weekend! You're comment about Easter Sunday dresses is so true. I never plan on wearing a dress on Easter in Wisconsin cause I know it will be too cold. This year it was brutal, and yet we still saw women at church with Easter dresses and bare legs at church. We laughed at them. Mean, I know. Anyway, I LOVE this dress! You look amazing in it!